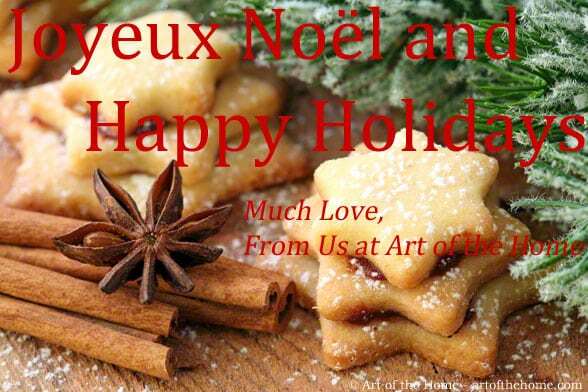 Joyeux Noël and Happy Holidays to You! We will be en vacances de Noël (in winter vacation) but we will be back with more recipes, tips, French country deco ideas, translations of your favorite French songs and much more to start a beautiful new year with you on Tuesday January 3rd, 2012. So stay tuned and in the meantime, feel free to come and visit us — we will be updating our Video du Jour daily and posting our morning questions on Facebook so we will still be checking up on you! And before we leave you for the holidays (we’ll miss you! ), we wanted to share with you one of the song that is most fredonnée (hummed) during the holidays in France. It is sang by Tino Rossi – the warm and sweet grandfather like voice of Christmas. His most famous and most played Christmas song in France is Petit Papa Noël (Little Santa Claus). Hope you enjoy the video and the lyrics as well that we translated for you. So in the video below, you see Tino Rossi during a Christmas special on French TV (you may also spot at the end Georges Brassens) singing his traditional Petit Papa Noël (Little Santa Claus). Enjoy! Petit Papa Noël! Little Santa Claus! So once again, Joyeux Noel and Happy Hoplidays dear readers (chères lectrices)…wishing you much joy and happiness!